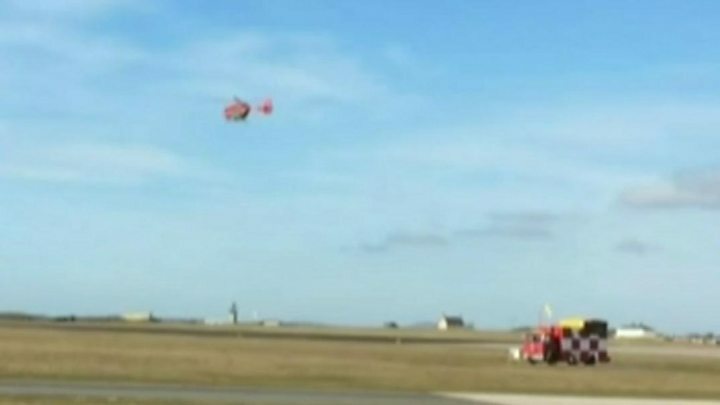 An engineer has died after a Red Arrows jet crashed at RAF Valley on Anglesey. The pilot of the Hawk aircraft, which is used by the famous aerobatic display team, survived and is receiving treatment in hospital. 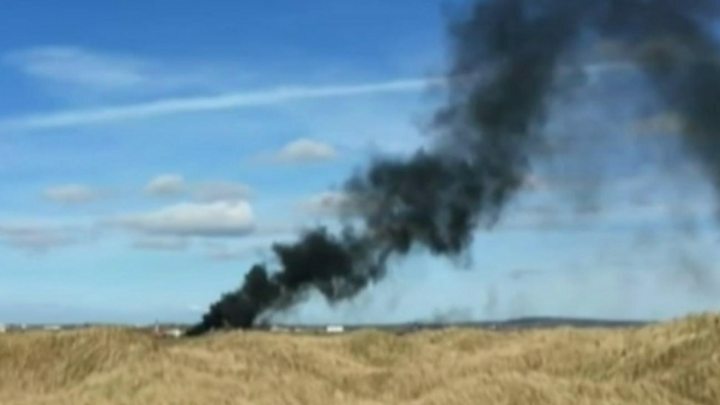 Eyewitnesses had reported that only one person had ejected from the jet before it crashed and burst into flames. An air ambulance was sent to the scene at about 13:30 GMT on Tuesday but it was later confirmed the engineer had died. 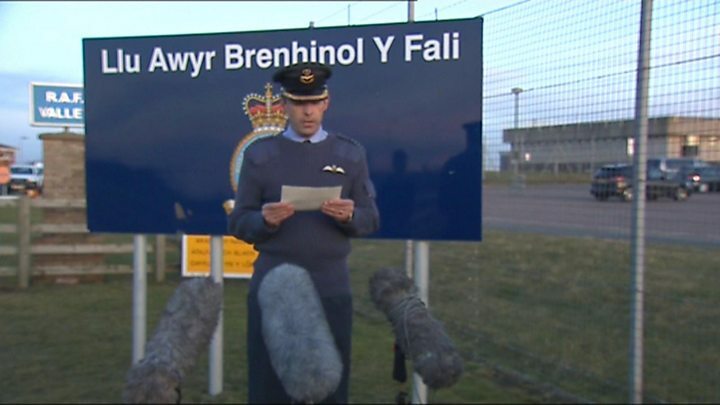 Reading a statement at the RAF base, Group Captain Nick Tucker-Lowe described the crash as a "tragic accident" and said the families of the engineer and the pilot had been informed. Air Chief Marshal Sir Stephen Hillier, head of the RAF, said the crash was a "reminder that we must never take for granted the risks our people take in the service of our country". "My deepest thoughts are with the friends and family of those involved at this terrible time," he added. Prime Minister Theresa May said: "My condolences to the family of the RAF engineer who sadly died today on Anglesey. "My thoughts are also with the pilot and with the Red Arrows following this tragic incident." North Wales Police said its investigators, supported by other specialists, would begin a joint investigation led by the Air Accident Investigation Branch. Eyewitnesses had described the moment they heard a loud explosion. 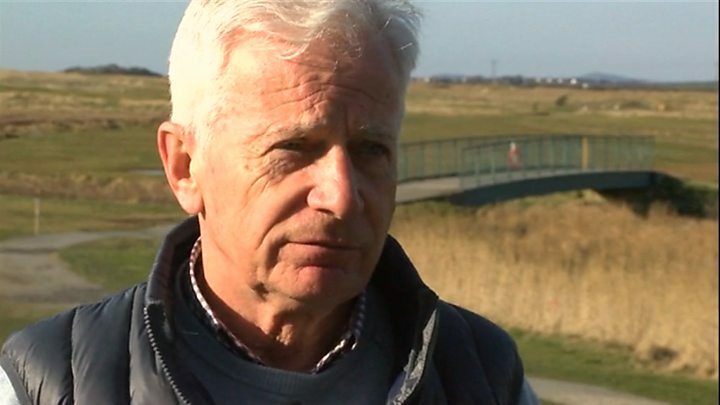 Howard Rigby, who was playing golf near RAF Valley, said: "I turned immediately to the airport; I could see a ball of flame and a multi-coloured parachute. "Just one parachute, not very high - which is a bit worrying. I immediately knew there'd been a major incident." Sian Rebecca Williams, 18, was waiting at Rhosneigr railway station when the jet flew overhead. She said: "The Red Arrow came over and because I'd hardly seen one before I thought 'Wow, it's out'. "From what I remember, it did a loop and flew towards the runway and looked like it was about to land. "As I was looking I saw the parachute of one pilot open and then the plane hit the runway with a bang and a crumbling noise. "Then it just burned bright orange and there was smoke everywhere." The on-base fire engine drove out to the wreckage "instantly", she said, putting the flames out before an air ambulance arrived. Anne Wilson, 52, who works at nearby The Anglesey Golf Club, saw the aftermath of the crash. She said: "I heard a very loud noise - we are used to the planes going over, but this was unusual. "I did go and have a look and there was a big fireball and lots of smoke... quite a few of the members actually saw it. "They said the plane came in quite steeply and saw a pilot eject, but that it was very low to the ground when they ejected." A Welsh Ambulance Service spokeswoman said it received a call about the crash just before 13:30 GMT and it sent an emergency ambulance and an air ambulance. It is believed the aircraft was flying from RAF Valley to RAF Scampton, Lincolnshire, where the Red Arrows are based, when it crashed. The Red Arrows are the RAF's world-famous aerobatic team, performing stunts and daredevil displays in the distinctive Hawk fast-jets. It is understood the aircrew had been at RAF Valley for routine Hawk simulator training - something that takes place once a month. In total, about 1,500 service personnel, civil servants and contractors work at RAF Valley.